Merchant and Ivory's first joint production, The Householder, has all the calm pacing and quiet expression you'd expect. 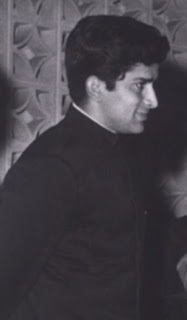 Two years before my beloved Shakespeare-Wallah, IM + JI + Ruth Prawer Jhabvala + Shashi Kapoor already equaled wow. I found this movie sad and thoughtful and funny (often at the same time), and it left me passionately hoping that, forty-five years later, society has changed enough that the roles these characters find themselves restricted by are much easier to overcome. 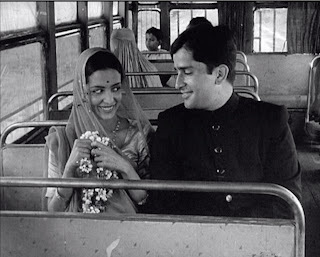 Prem (Shashi Kapoor) and Indu (Leela Naidu) are very new newlyweds and have no idea what to make of each other. "How can I like her?" Prem wonders to another new groom. "I don't even know her." Prem is also lost on the job as a college instructor, unable to control his classroom, stand up to a rude colleague, or work up the guts to ask his principal for the raise he and Indu need. Prem meekly scampers away to begin a search for counsel that leads him to one ridiculous piece of advice after another. Prem eventually figures things out, though, and he and Indu find smiles and sweetness creeping in. And at the very end we all go "awwww." The actors nail their roles. 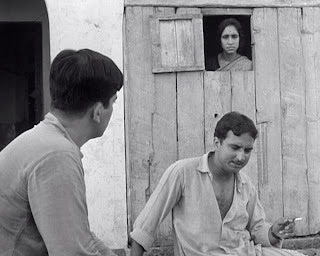 It's really too bad Leela Naidu did so few films - I thought she was great here, calm but strong and feeling. 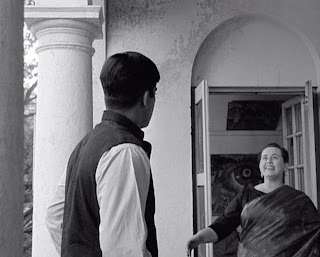 Durga Khote is enjoyable as Prem's coddling and completely overbearing mother, but I thought Indu Lele as Prem's school principal's wife was even more giddily fierce and farcical. (She's in the second picture from the top.) Shashi is both funny and sad as the completely befuddled, whiny, selfish, childish Prem, a man who needs to grow up pronto. By only eight minutes in, I told PPCC that I wanted to smack the crap out of him and tell him he can clean up after his damn self. 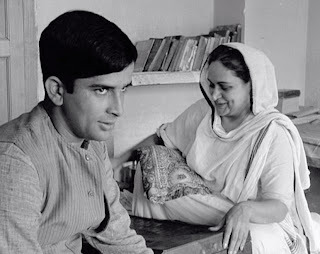 Given how much I adore Shashi, that's some good acting. Prem consults his friend Raj about marriage because Raj has been married for three years and Prem therefore thinks he knows everything. I think Raj's wife, in the window, would disagree. Indu and Prem plot to get mother-in-law to cut her visit short. Here Prem contains a gloat when their scheme works. Sharing a happy moment on the bus ride home from a wedding. Look how close together they are, no space between them, a nice contrast to earlier scenes in which the curtain hangs between them. A further note on the DVD itself (from the Merchant Ivory Collection): the audio is surprisingly bad. I don't know diddly about making films or transferring them to DVD, but DVD Verdict Review perfectly describes the problems with this one. I had to turn the volume pretty far down to be able to understand the words - in the dialogue and the music, there was way more sound than actual information, if that makes sense. It's been awhile since I did a List of Stuff I Noticed That Doesn't Fit Anywhere Else in this Post, so here you go! Note to self: do not become crazy, yoga-advising memsaab shacked up in Delhi with a bunch of annoying proto-hippies. Here's one of the nonsense-spouting Americans, running around in the Ram Yantra, becoming one with the universe or some such. Fab, right? 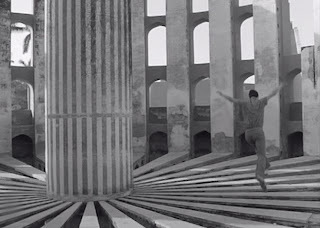 The Jantar Mantar structures are stunning on their own, and the effect here is really cool - you hear the slap of his sandals as he hops from surface to surface. This one doesn't relate to the story, really. Prem's students don't pay him the least bit of respect, and here they read Filmfare and ape movie stars while Prem stares out the window. As if to make up for the lousy sound, the DVD had some fun extras: an interview with the filmmakers (and Shashi too), Merchant's first film The Creation of Woman (which was Oscar-nominated), Ivory's second piece The Sword and the Flute (both of these are very worth the watch, by the way), and some great archival photos of Shashi at the time of shooting. To quote Filmi Geek, guh. * I borrowed this term from the excellent young adult lit series by Louise Rennison about English teenager Georgia Nicholson. Rennison invents addictive slang like you wouldn't believe. 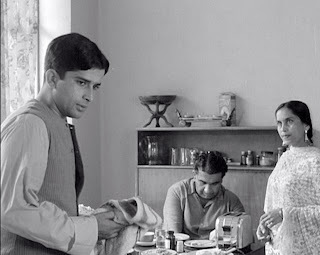 This is one Merchant-Ivory movie that I really liked inspite of its slow pace and rough edges. The travails of arranged marriages probably arent like that anymore but the dynamics of these relationships is still quite similar and the movie is interesting because of that. I just wish M-I hadnt brought in their brand of mysticism-of-the-east motif that seems to run through all their movies. In an account of a young couple's adjustment to married life, there was no need for the proto-hippies. Most of their Indian films were peppered with gurus, swamis, people looking for spiritual salvation, etc., and it seems like the eastern mystic and spirituality were de rigueur to make them seem more Indian (or exotic). Achla Sachdev! She was good - so cheerful and meddling (but in a good way)! Glad you reminded me. And now that I know who she is, I realize I've seen her in quite a few other things. As for the exoticization, I think in this particular film they're making fun of it, because all those characters are idiots - underscored by the bombastic and totally typical western classical music playing in the background of their house. But apart from Shakespeare-Wallah, I haven't seen any of their other set-in-India or related-to-India films to comment. What do you think is the purpose of this trend in their films? It seems kind of odd that they'd do that, given that one is Indian and the other seems to be fairly knowledgeable about India, has worked there, etc.? 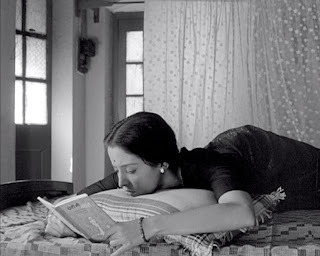 Havent seen Shakespearewallah yet (its on my shelf waiting to be watched) but all the other "Merchant-Ivory in India" seem to have spirituality in some form or the other. There is Jennifer's character in Bombay Talkie going to an ashram to find mental peace; there is the character in Heat and Dust who comes to India to follow in her great aunt's footsteps which includes going through an abortion at the hands of a practitioner of traditional medicine; then there is Deceivers which turns a perfectly good adventure tale into a long exploration of the spirituality of Thugee. They make fun of spirituality in Bombay Talkie too, but it still appears to be gratuitous Orientalism. Given that they have such an Indian background, it is a bit strange and gives their movies an outsider-looking-at-India air. Its probably because their target audience is in the west and this gives an exotic touch to their movies which might appeal to the audience - but it really puts me off! Bollyviewer - I think you may have nailed it there, that the exoticism is spun for western audiences. There must be something written about this somewhere - I'll try to dig around and see. In general, I think it's entirely possible that MerchIv (hee) are Orientalist more to our eyes than they seemed at the time, but who knows. That might be too lenient an approach. And then what do we make of (in this case) Indian actors and other crew who participate in an exoticizing project? As for their films set in other parts of the world, do you feel they do that to those areas? I think one could probably argue that A Room with a View exoticizes Italy, but then again that's pretty much how the book is and the people who go to Italy looking for Art and Truth and Other Things Like That are, to my mind, clearly being affectionately lampooned. You are right about the exoticization in MerchIv (love this!) and perhaps with a lot of older English literature, too. It just never struck me before (except when it applies to India) probably because I have read mostly English literature and tended to view Europe from the British standpoint. Now that I have seen other cultures, I know English literature is just as bad to them (in a different way)! Having said that, I still find it difficult to take, from movie-makers with such a strong Indian background. Hollywood actually did a better job at times than MerchIv in the Indian context. One example that comes to mind is Bhowani Junction (1956) that stars Stewart Granger and Ava Gardner. 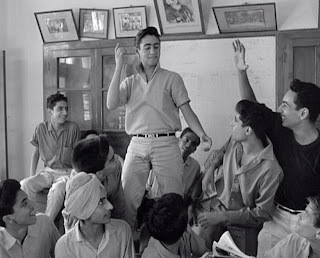 The film tells the story of an Anglo-Indian girl and a British army officer in 1947 India with the imminent Indian freedom and its ramifications (for the British and Indians) as a background. Interestingly, Bhowani Junction was based on a novel by John Masters who also wrote the novel on which MerchIv's The Deceivers (1988) is based. The first is an interesting movie while the second lands up being a boring exploration of thuggee spirituality inspite of having a better cast (Bhowani Junction had white actors in brown paint for Indian roles) and production values! *Way OT: OMG the Georgia Nicolson books are vair vair amusing and filled with humorosity! I luuurve them all! I've never heard of Bhowani Junction - I'll have to see if I can get my hands on it! Dear god, the brown paint. I'm currently watching Pyar Kiye Jaa in which Indian actors have white paint on their faces. My favorite example of ridiculous face-painting is Khushi, in which Kareena and Fardeen appear in..."Latino face," I guess we'd have to call it. WILL IT EVER STOP?!? Spygirl - laughing like a loon on loon tablets!